So I checked online, and there were only a few places selling them. And all of those places wanted $130-160 for a pair of goggles. The places that still listed these are for sale were sold out, having them out of stock. The only place that didn’t say out of stock, was Wal-Mart, but they didn’t have any online. Only in stores. These were $50 goggles when they were released, and so paying $140 for them seemed silly. Especially when real ones are $300. Wal-Mart did show a few stores nearby stocking them, but couldn’t ensure they were there. I’ve been making it a point to walk around the toy section as I visit different Wal-Marts over the last week, but the 2 I’d been to only had the binoculars. Until today. I headed up Arapahoe Rd after my massage to check that one, almost skipping it, and found multiple pairs there. I grabbed one, and Delaney got his gift, finally. I set a goal last year of running every day for a year. I reached that goal on Sept 9, 2009, and then needed a new one. I looked around for awhile and finally decided to try and complete 2009, running every calendar day. I did that today, finishing my 478th day in a row, and completing at least a mile run every day of 2009! Next up, getting to 500 days. I got Tia a Wii Fit for Christmas, which she’d been wanting. After skiing I came home to find her and Kendall working on it. Tia went through it and it was similar to a Rebook Step from what I saw as I walked past. I had to work, so I didn’t watch a lot. However when I went back to try and do some Beatles Rock Band last night, Kendall was working the yoga section. I kept trying to interrupt, but she said that she needed to finish 2 hours. She’s been getting a little heavy and we’ve been trying to motivate her to work a bit more, and she realizes it. So I watched her finish her last 5 minutes of yoga. Trying hard to do a good job according to the screen. Neat to see her working, and she’s back at it this morning, with Delaney watching the Civil War series he got in the background. At least I got a little time to rock out last night when she was done with her two hours. It was the ninth day of skiing for me this 2009/2010 season, and that’s going to be it for this year. Delaney and I headed out today for another ski day. We had planned to bring Kendall, but when I woke her up (8:20) she was tired, said she was sick and didn’t want to go. So we headed up for a long day, getting stuck in traffic both ways. There didn’t seem to be accidents, just a lot of traffic, so we moved along at 40mph or less for some good stretches. Still it wasn’t bad up there. The forecast was 22F, some snow flurries getting an inch or 2 and 10-20mph. Instead it was cold, but very little snow, and almost no wind. and one of our early runs. It was a good day for us, no real issues or spills. I hate cleanup night, but the maids are coming tomorrow and I want to ski with the kids, so we need to get things done tonight. A necessary evil, and I'll feel better coming home to a clean house tomorrow. Once again, another day, and Toshiba has not updated the status on my laptop. I think I might really need to think about abandoning this laptop, and using Toshiba again. There were a couple nice deals on Satellite machines, but their inability to communicate or make something happen over weeks makes me rethink things. I called support today to try and get them moving, but all I could do was leave a message with the depot, who refused to answer the phone. Perhaps they’re busy, but knowing those systems, likely they have a recorded message that says they’re receiving high call volumes 24 hours a day. I have heard good and bad stories from other manufacturers, and I know that they all have issues, but this is especially problematic for me, and since this is the second repair, this is really, really annoying. I am tempted to move forward with an Acer, which can’t be any worse, and would be much less expensive. I went with Tia this morning to the ortho for a follow-up appointment. This was the worst one yet, with us waiting in the room for almost an hour before we see the doctor. That’s problem in US healthcare, and I chalk some of it up to lack of interest and caring on the part of staff’s, most of whom don’t make any more money for seeing more patients, or having any satisfaction. It’s not like this is a big office with that many rooms, and there’s a separate X-ray tech for half the people, so why the wait? I was especially peeved since we didn’t stop for coffee on the way there and I was hungry. I thought this would be a 15-20 minute stop before we went for breakfast together. So the doctor rotated her wrist, pressed on it, looking to see if there was tenderness and what the range of motion was. He thinks its still limited, but wasn’t sure it was ready for PT. The bone wasn’t necessarily healed, but he decided to wait another couple weeks before taking another X-ray and checking how it looked. We did get to IHOP afterwards, and I felt much better with some coffee and food. It’s been almost 4 weeks without my laptop. I mailed it back to Toshiba and they received it on Dec 4. They then worked on it, and I got a few updates before they shipped it back on Dec 13, which was within their 7-10 business day window. I got a great lack of data about what was wrong in the package with a blank tech report. I did get some updates on the web, which listed a replacement system board and graphics board. I had it for about 12 hours, having it blue screen while booting up on Dec 16th at night. I even pulled the memory chips out one at a time, replacing them back in to check on those being bad. I also tried to reload the OS, none of which worked. It constantly core dumped before loading Windows. So I immediately took it back to the UPS store after calling Toshiba on Dec 17 and shipped it out. The Depot had it on 12/21, and since then I’ve had one note on 12/23 that says "diag - error code 0x0000009C""
No idea what that means, and I can see the tech having the 24th and 25th off, but today? Nothing? Shoddy service, and it’s a huge pain. On the 12th I almost bought a new laptop from Amazon thinking that it would be good to have a spare. Then this past weekend, being unable to write upstairs, I started looking again. I remember Glenn Barry talking about his PDC gift, and I checked out the specs. It’s a nice machine and has one thing I think is pretty cool: it will connect with broadband by inserting a SIM. That might be handy, and easier to use the tethering, which still seems immature. I found one for sale on Craigslist and I’m tempted to get it, but I want to be sure the keyboard isn’t too small. I also tried out the 11” laptop I got my oldest and that seems like the keyboard might just work, so if I don’t get the Acer tablet, I think I will get a spare 13” or 14” laptop just in case. The running streak application is off! When I hit one year I downloaded the membership application from the US Running Streak Association and filled it out on my laptop. It asked for a total of miles run, and I didn’t have a good total since I had tracked things all over the place. So I started to compile things, but got distracted with machine issues. When I sent off my laptop recently, it struck me that I might need to do a new application. Fortunately I found it synced up on my desktop and finished filling it out and compiled my mileage. It was over 500 miles for the year, which was cool. Today I finally got a stamp and mailed it off. I’m not expecting to get on the active streak list until Feb since it’s so late in the year, but look for me there. The Active streaks – I should be 220 when I go up, with my streak starting on 9/10/2008. There are also retired streaks, where I hope not to be for some time. Overall kids are hard, but for those of us that work at home, it’s really hard when the kids are around. It’s hard to concentrate, hard to get in the zone, and for me, hard to do any recording. Both little kids have friends over and they are running around, making noise, and it’s been a tough work day. I ran some errands around lunch thinking that it might be quieter when I got home, but no go. Kendall went to sleep last night and since Tia and the boys weren’t home, I had wanted to try out the Beatles Rock Band that I got for Christmas, so I fired it up. I’ve always enjoyed the Beatles, and running through some of their famous shows, a few songs each was neat. I loved the Ed Sullivan show, doing “I wanna hold your hand” and a few others. This morning I came down and got Kendall to fire it up with me and do a few songs. She was nervous about singing some, but then Delaney joined in and Tia, and we ended up going through a bunch of songs over an hour, switching instruments and taking turns playing things. It was pretty cool. It was a good time in the morning for us. We stopped for Q-Doba last night on the way to the theater. Delaney was meeting Tia, Kyle, and the aunt and uncle to see Avatar in 3D. Kendall refused to go, so I was taking her to the Alvin movie, not something I wanted to do. So I fortified myself with a beer and headed in with her. It worked out OK as I fell asleep for about half the movie before waking up to Kendall bouncing up and down in the seat next to me. She enjoyed it, and told me I missed a great movie. I think I made out alright. We almost got stuck yesterday heading out to swim, sliding around the driveway in the Prius. Then when I came home with Kendall, we were almost stuck on a hill in our neighborhood. The Prius kicking in traction control, which doesn’t help when you’re trying to get through snow. Kendall asleep, and me watching the speedometer flip from 9 to 11mph, while we’re going about 3 or 4mph. I thought for a minute I might have to get out and push, but we managed to creep the 50 yards up the hill in about 4 or 5 minutes before we slamoned down the driveway to the house. Kyle brought Tia home and then got stuck trying to leave again, with Tia helping him to get out. So I plowed today. I wanted to do it Friday, but it was cold, I hadn’t plugged the tractor in, and it wouldn’t start. I had my fingers crossed today, but I think the engine heater did the trick since it started up and I cleared it out. Not a lot of snow on the ground, but the Prius and Kyle’s car don’t do well in it. Outside our neighborhood the roads are fine, just not so clear here. I came down this morning to find Kendall making a slushy for herself. It’s not that hard, pour milk into a glass of shaved ice and use a spoon to enjoy. It’s usually a summer drink for the kids, but instead of using the ice shaver she had another idea this morning. She filled her glass with snow. We usually stuff stockings with little things for each other in the family. Sometimes it’s junk, or candy, but this year I tried to be a little better. I aimed for funny and practical, and cheap. My wife got some wiper blades since her truck needs them. My oldest got deer whistles since he’s worried about hitting a deer out here. All the kids got little flashlights, and there were a couple book lights in there. Me? I got pens! Nothing fancy, just a pack of cheap Bic clicker pens. It’s funny since I am always complaining that I can’t find pens. Despite all the stuff on my desk, I have lots of pencils, sharpies, and other desk instruments, but not pens. So finding them in my stocking was pretty funny for me. Another quite morning, though a little TV training needed for the new set. Kendall woke me up (am I the technical guy?) this morning saying the TV wasn’t working. I quizzed her to see if she’d picked the right input and she assured me she had. So I reluctacntly got up, came downstairs, stared at the TV for a minute and saw she had things set, until I realized that she needed to check the channel. The input from the TiVo comes in on Channel 3, so I think a little tape and a sharpie on the remote should help. She also showed me she’d tried the DVD input and it wasn’t working. Since the Wii and DVD both use composite inputs and there’s only one set on the TV. Very annoying, but our old technology is the issue. I did check the DVD player for an s-video input and it has one, so I need to track down or buy a cable today to make things easier. Yesterday was quiet, and a little boring/annoying for me as it wore on. The kids weren’t interested in doing anything with me in the afternoon, and after I set up the TV, I was left with little to do other than run. Then when the Titans-Chargers game started, Kendall wanted some time, so I hung out with her and watched some TV. I think I was still tired from the night before, despite sleeping in after presents since I was out shortly after 10. Kendall woke me up, and so I worked a little today, trying to get some writing done while things are quiet. We did have some sugar cookies from Kendall’s Easy Bake oven. That was a little adventure since she unpacked it and informed me she needed a 100W bulb. I gave her one, she set it on the table and it promptly rolled onto the floor and broke. Since we’ve started to move to CFLs in a few places, I didn’t think I had any more of those, but I managed to track down one in my closet and gave it to her. This time I put it down myself while getting things read. It’s funny to think that those toys, now probably 30 or 40 years old, will be paperweights before long. With the demise of standard bulbs in the next year or two, I told Kendall and Delaney that they won’t be able to get that toy for their kids. At least not like that. I suspect that we’ll get some new technology in the future to replace it for kids cooking. I didn’t get to Beatles Rock Band, actually I’d forgotten about it early in the day since all the presents are buried under wrapping paper in the living room. I had to search out my Star Trek DVDs in there, stepping on a few things in the process. I’ll have to get kids to clean that up today. Kendall did get a cleaning lesson, since I had her clean the baking pans before, and after she cooked. Wonder if that mattered since she didn’t want to cook anything after the cookies. They came out alright, and the oven promptly moved over to the living room for non-plugged in play. My kids have some imaginations, wanting to play with things their way rather than the way they’re made. Delaney does that all the time, and we had a nice incident with that yesterday. He said he was disappointed that he hadn’t gotten his night vision glasses. It was a “doh!” moment for me since I’d ordered them, but I forgot to wrap them. Tia saved things by telling Delaney we’d gotten them in case Santa didn’t and were going to send them back if he did. So Delaney asked where they were, Tia looked at me, and I shrugged my shoulders. A trek through the house produced them and we gave them to him. However he was disappointed. These were binoculars, and much better than the original goggles. He said, after reading about them on Amazon that he really wanted hands free ones to play with, goggles that fit on his head in a monocular fashion, even though these were better. He was more interested in having them fit his play than working better. So I have to ship the other ones back today. Kyle then came over to talk about disk space last night. He was worried about all his music on his new laptop. I told him he’d need to watch it, but if he uses iTunes and the AAC compression, he ought to be fine. I think the disk in his laptop is actually the same size as the one in the iMac from 3 years ago. Amazing how much things have changed. Overall it seemed like a subdued Christmas, especially with Kyle/Tia gone. I wonder about next year when we’re trying to book Christmas week up in the mountains, and actually have presents up there. That will be interesting. My second Christmas Day run in a row! The kids were playing, things were relaxed, and I was hungry, having only eaten a little. I wanted to enjoy Christmas Day after this with a beer or two, so I went for a nice run to earn it. Everything felt great, but I moved up to 6.6mph as part of a pyramid and it was tough. 2-3 minutes there was enough, and I worked my way back down again, through 6.4, 6.2, and then 5.6 to close out. Now that I’m up. We were up late, up early with the little kids trying desperately to get us up at 6, and then both Tia and I went back to sleep. It’s a nice day, and the kids are having fun. Kyle and Tia are heading up to ski while I stay back since the little ones want to hang out with presents. With some of our family over for dinner and some time, we ended up with a pretty good Rock Band session, everyone giving it a try and playing different instruments. The drums are definitely the hardest and most everyone struggled. Delaney, Kris, and Tia tried the guitar, picking it up to various degrees. Nice to see Delaney playing it, and we had a good time. I went online later and we bought a few more songs, finding some good ones to play with the family. I think Rock Band is a great family/friend game to play in a group and get people to do their “air band” imitations. It’s not making music, but it’s fun. I have a little video I’ll try to get up tomorrow. Tia grabbed me this morning, saying that she needed me to help move hay. Apparently the guy that was delivering them couldn’t get them into the barn all the way. She couldn’t remember exactly how to drive the tractor and didn’t want to learn with this guy waiting, dogs running around, and snow coming down, so I asked her to start it and got geared up to go outside. This was the first day wearing snow pants, but I didn’t have on boots, which proved to be a mistake. In any case, I did warm up, and then drove the tractor over to the barn, using it to push some big bales around. The guy had unloaded the first two, but one was tipped on it’s side, and the they were too close to the door. He couldn’t push them with his truck, so we used the tractor to move them. It was surprisingly easy, and I have new respect for the power of that machine. The big bales are about 1,000lbs., and around 3ft square on the ends, and about 6ft long. They’re huge. While we could tip one that was on it’s side over (I guess they’re about 3ft x 4ft), we can’t slide them at all on the floor by hand. It makes sense to use them since Tia got 6 big bales for $600, and that should last 6-8 weeks, depending on temperature. We also got about 150 small bales, about 60lbs each, for $1200 and those will last about the 3-4 weeks, half the time. Big bales make sense! So I pushed the first two over and then backed up. They’re delivered on a large flatbed, and he tilts it to slide them off, backing up to push them. It’s not exact, and if he isn’t straight, they end up blocking space. We learned today the tractor can move them, so as he unloaded them, I pushed them deep into the barn. The guy then said that I ought to be able to flip one up on top of the others, so I tried that and it worked. Instead of most of the barn full of 6 bales, I managed to flip one up and only 5 are there. If I had more time, I’d try to flip another one up, and might do that this weekend. I also had to push the guy’s truck, which wouldn’t start for some reason. So I used the tractor to get him moving, and he popped the clutch to get it going. The tractor was very handy today. I thought that I had almost everything done, but a few last minute things were needed, among them a Santa hat. It was snowing, not a blizzard, but coming down and I debated about going until a friend called and reminded me we had a lunch date. I almost cancelled, with a bunch of work to close out the week, but Tia then needed me outside, so I went. Surprisingly it wasn’t too busy and I managed to load up on a couple gifts and stocking stuffers that were needed. Now we just need to wrap things up and we’ll be done. Or I will be. Tia still needs a few things. Windows 7 just dropped off the network, acting like a cable had been unplugged. I rebooted the machine after trying a few things before finally rebooting the router and then using the Windows troubleshooter to reset my IP configuration. Very strange and disturbing, especially as I was in the middle of updating podcasts. It’s working now, so I need to finish work ASAP. I woke up last night, nose running, throat a little sore, and my neck hurting more. I must have done something yesterday to aggravate my body and I’m paying for it. Still it was worth it and we had a great time. I’ll have a few down days here and the neck will get better and I’m sure the cold will fade. A great day skiing at Keystone. Actually a late day, not getting up there until 1, but we skiied until almost 7 before heading some. The kids had fun, everyone skiied well, and it was a nice day. Overcast, but not windy, and not too cold. I’ve been interrupting Delaney on the XBOX to play Rock Band for a few weeks. I could get him to play sometimes, but most of the time I was just annoying him. Kendall will play with me, and we had fun at a Christmas party, so I decided to move to the Wii platform. Most of those things are wireless anyway, and the cords are a pain, so my plan was to get a Wii version and sell our XBOX version. I searched around, and found someone selling the Wii version, sans guitar for $80. I couldn’t find it for less than $130 around the Internet, so I decided to grab that one online. It ended up being $100 with shipping, and arrived earlier this week. Everything worked, and I picked up a guitar with Guitar Hero V for $60, so I was $160 in. I listed the XBOX version on Craigslist and got a bunch of spammers, and one guy interested, but he must have pinged a few people as he’d found another when I called him back. I was thinking to move it to eBay after a couple days, but I had a guy ping me today. He said Wal-Mart had the set for $90, so would I take less than my $90 list price. Sure, what the heck, it’s for his kids and we agreed to meet tonight. Since I was out his way, I packed it up and took it to him, selling it to him for $60, so I’m $100 in to the new platform, and I think it’s great. The Wii store makes it easier to find songs than the XBOX one and wireless is fun. Now we just need to get some people around and have some fun. Christmas Eve looks like a good time with people coming over. I helped Tia work on the horse area today, then we ran to the ranch store for a few things. We got home and things felt weird. I got some work done, and then packed up Delaney, realizing as we were driving away what it was. My plan was to skip karate since I thought I had Kendall duty and I figured I’d run later. Tia got Kendall, however, and so I was off the hook. I would have done karate, but I didn’t have my bag. No big deal, got home, checked work, and then it was off to run. Felt good, though I took it easy. We’re going skiing tomorrow and I’m thinking I’ll run before we go. My neck is sore again today. Actually sore is the wrong word. I have shooting pain in it when I move it some ways from a pinched nerve. It’s very annoying, which makes for a long day. This is a day I’d love to have my laptop and work in bed. The temptation is growing to actually just go buy another one. Tia got new teeth for her harrow thing, and I said I'd help her replace them. The box they came in was full of heavy iron pieces and we didn't want her straining. I thought it would be as simple as removing the cotter pin and bolt from the old ones and slipping the new ones in. There is a bar that the cotter pin and bolt hold in and then the teeth are held in with a nut and bolt. It was windy, and a little cold, so I carried them back to the garage thinking that the workbench and vise might help. They did, but this thing has been outside for 2 years, and the bolts were hard to move, and the nuts almost impossible to loosen. With each one in the vise, I was able to loosen 4 of the 5 with the aid of some WD-40 and some elbow grease on an adjustable wrench. One wouldn't come loose and I think might need to be cut off. However I was straining a bit, and I managed to pinch a nerve in my neck. Very, very annoying, and it hurts. At least I got a few things out of it. It didn't keep me from getting the cart I was working on almost finished, and a place for my bar clamps, but it did mean that I wasn't up for wrestling with large pieces of plywood and trying to get another cart going. Didn't even want to lay them out and start measuring and marking. Now I think it's time to lay down and try and relax the neck. Actually sleeping early and sleeping in. My throat started to get sore last night, or late in the afternoon, and I actually knocked off work about 5:30, earlier than I planned since I’d missed some time getting kids, and went to lay down. Tia brought me some soup and I took some Nyquil, and that was it. I guess I feel asleep around 8, watching a movie with Tia and slept pretty good until 4 or so in the morning. Then I was tossing and turning, but I managed to not get out of bed until 9. Nice to sleep in and not have anything planned for today. The kids had half days of school, which is OK, except that we don’t know when the bus is coming. I asked the school when it ended for Kendall the other day and then guessed at the time for the bus today, but it was still late. Delaney told me when his school ended, but he was wrong, and his bus was really late, so I ended up sitting there for about 45 minutes between the two kids. Delaney was especially annoying because I dropped Kendall off at home and then ran back to get him, not taking the time for a rest room break. I didn’t want him walking home in the windy, 36F weather. Ended up wishing I had taken the time since I was waiting a good 20 minutes for him. At least my wife is home. Tia caught an earlier flight and got back around lunch time. I’m not sure it’s true. I don’t think I have iPhone Stockholm Syndrome, as suggested by the article. It’s actually written about mobile operators, not end users, but it does raise some interesting points. I’ve had a lot of people say that they won’t buy an iPhone because it’s a closed platform, and it locks you into Apple’s business model. They prefer Windows Mobile, Android, or Blackberry instead. I don’t get the last one because as handy as a Blackberry is, you’re locked into RIM and even need to purchase a license for their server to get the benefits (or subscribe to a telco version of the server). I’ve said it before, that I think the iPhone is the best phone I’ve had. I had a Windows Mobile 5.x and a 6.0 phone, both of which I liked, but I had hardware issues. Actually I had a Dash that was too fragile for life on a ranch. After breaking 3 of them, I moved to a Sidekick. That worked, but it was an older, antiquated interface (I had a Sidekick 3) and didn’t serve my purposes that well for the modern techie. Then I got a G1, the first Android phone on the market. I thought that was much better than Windows Mobile, and the phone itself was more durable. I liked the interface, and thought that the touch screen was very handy. Over time I found myself using the virtual keyboard instead of the physical one. However then I got an iPhone. I had a chance to get one for free and jailbreak/unlock it, so I did and I loved it. The main thing that prompted me to move was that I had been reading on my iTouch and listening to music, both of which did not work well on my G1. For one thing I didn’t have an easy way to sync itunes and the G1, and there weren’t any bookstores with reading apps for the G1. I had hoped Barnes and Noble would build one, but as of the time I’m writing this, they still haven’t. The iPhone, while the hardware and software is closed by Apple, still allow lots of apps to be distributed. I know the Google Voice thing got them upset, but I think that was more an ATT issue than an Apple one. Yes, with a more open OS it might not have been blocked, but the networks still might have prevented the packets from going to Google Voice. Windows Mobile is controlled by Microsoft and while you can install apps on your phone, they don’t have a good storefront from which to get apps, nor is there support or backing. In fact, when I had a phone and had issues, the carriers refused to talk about problems there. Maybe things have changed there, but when working with T-Mobile, they were more than happy to help me get it working and even offer advice. Android has lots of apps, but the lack of a mature store was something I noticed right away, especially away from the phone. I don’t want to do everything on the phone because it’s just hard. The iTunes/iPhone integration is smooth, I can buy from either interface and have things synced without my doing anything more than plugging in my phone. Perhaps I have some Stockholm Syndrome, but from what I’ve seen so far, the iPhone is just a more mature platform right now. I don’t expect that to change in 2010, but I bet by 2011 that Android, and perhaps Windows Mobile will copy a lot of the iTunes features and we’ll be back to buying phones more on price because all the features will be available on all platforms. At least the present part of it. I had to ship my laptop back today, so I decided to stick in town and get a little shopping done as well. Knocked out one of the big presents for the year and then came home and did another one. I actually think that I’m almost done with presents a week early. A crazy morning for me. It started when I woke up at 5:15, my nose running, forcing me to get up and find some tissue before it leaked all over my face. I took some daytime nyquil, which has been by my bedside all week, and went back to sleep. I next woke up with Delaney shaking me at 7. Since his bus comes at 7:02 I didn't think we'd make it. I think with Nyquil in my system last night (nighttime), I forgot to set the alarm. So it was get Kendall up, get kids fed, and then pack them in the truck. Oh yeah, it was trash day as well so I had to load that in the truck, drop it off, drop off Kendall 10 minutes early, and then get Delaney to his school 12 miles away. He was a few minutes late, but not too bad. To top things off, when I drove away I saw that Gemini had walked out the front gate to the neighbor's yard to see their horses. It's not a big deal, and he won't really go anywhere, but I was dreading coming back and walking up to get him. As it turned out, my neighbor saw him and walked him back down. One less thing to do. Horse chores, getting them fed, cats fed, and then to work on a day when we had upgraded the site last night. A few things weren't working, and thankfully they weren't critical, but it has been a crazy day so far. I don’t have the sore ankle for once. Actually I do have a sore ankle, but this particular one is Delaney’s. He came home yesterday saying he’d fallen at lunch and twisted it while playing some game with kids. It was sore, and he hobbled around on crutches at home, despite hobbling around without them at school. I gave him some ice, had him sleep on it, and wrapped it with an ACE bandage this morning before school. I wasn’t too worried as it wasn’t that swollen. Slightly, but not that much, however it was tender. I picked him up and he was limping to the truck. He gamely asked if I thought he should do karate tonight, and I told him no. He should rest it for a few days and see how it feels. There’s a 5th grade program (and 6th) from Vail resorts. I had no idea, and I’m slightly tourqued. It’s the 5th and 6th Grade School of Shred and I am sure this wasn’t listed when I was looking for season passes. Not that I would have necessarily gotten it since Delaney’s been 4 times already and would have used up time at Keystone, but maybe we would have and spread out our days among the other resorts. I might even have spent the other $200 for the rest of us to get Vail passes and then we would have had 12 days, which isn’t bad. That might be all Tia does for the year, so it would make sense that Delaney might not get many more. It’s good that Vail Resorts is implementing this and not worrying about the $200 that they lose from the kids. After all, who’s going to take the kids? Likely an adult will either spend $400 for a season pass or $400 for 4 lift tickets to go with them. I received this e-mail and I would like to know if it is true. If it is, the Internet may have just become one very good source of advertisement for your company! . I know I would go out of my way to buy products from Sears instead of another store for a like item, even if it's cheaper at that store. It also mentions the extra pay that Sears employees get while serving. I’ve had issues with Sears in the past, especially as I’ve seen some out dated IT systems from them and a lack of customer service at times. However I can forgive that lack of investment in IT or streamlined systems if they are spending money on our soldiers. There’s more to life than making a profit, even for a corporation. I was feeling a little more sick last night and I knew things were turning worse. Sure enough, I woke up with a runny nose, slightly sore throat, and extra tired eyes. No snowboarding today, and trying to keep warm and take it easy. Thinking we might skip scouts tonight so I can sleep early. I was hoping to go snowboarding tomorrow, but I'm feeling sick and Tia leaves tomorrow night for CA, so I'd rather spend the time with her. Maybe I can get up there Thur or Fri to enjoy some of the nice weather this week. I hate getting sick, and I'm fighting a cold. I'm slightly run down at night, my nose tickles and sends me into sneezing fits and the throat is on the verge of soreness. It's right on the edge and I'm hoping staying warm, getting some sleep, and some medicine will knock this thing out soon. It was good to run today and also karate tonight. Both helped me to feel a little better after straining a little. It’s done, though I’m nervous about my laptop repair. The last entry on the machine prior to shipping is “repl hdd""
It’s not the end of the world, but I had already replaced the HDD with a larger one, I could read the one in there and backed up most everything I could think of. Still, my concern is not that I’ve lost data, but that I’ve lost space. I was going to rebuild to Win 7, so this is a good time to make it happen. After our Rock Band session, Tia and I went up to rest a little. She was still tired, as was I, so we lay down, the Broncos on TiVo and talked for awhile. It was good to sit there and spend time with my wife. At least until she fell asleep. She drifted off and it was still nice laying there with her hand in mine, but not as nice. So I watched the Broncos get beaten up a little by Indy. The kids watched TV and played KNEX, I fed them, and started getting ready to run. As I dressed, the Broncos made a game of it, so I watched a little until they let Indy score a late touchdown and take a big lead. Then a run, finish the game, eat a little leftover lasagna, and now we should be decorating the tree. A quiet Sunday at the ranch. This is pretty good, mixing Guitar Hero with Christmas lights. It must be picking up again, despite the lack of a sharp rise in energy prices, I am seeing more news about wind projects coming online. The latest one is a Rhode Island project from Deepwater Wind, to build an offshore wind farm. I don’t think wind is the answer, but it’s a part of a way to generate power. We have lots of wind, it blows all night as well as during the day, and we should capture some of that. It’s good to see larger projects getting going around the country. I’m not sure about offshore wind, but this will be interesting. We do make offshore drilling work, which I’m sure seemed like a silly idea at some point, so maybe this will work. There is a lot of knowledge about building structures to survive the incredible forces of the ocean, and I’m looking forward to seeing how feasible this is. I have thought that small scale wind isn’t necessarily a good idea, though I’m testing some of that myself. I ordered a development kit of a Windbelt power generation kit and will set it up out at the Ranch with the idea of powering a small LED light, or set of lights. My thought it to get this out near the gate where we can’t run power (too far), but could use lights for the gate or the keypad next to the gate. If there’s enough power, I might even try to light the street number. If it works OK, I might even look to modify it to have a capacitor or battery of some sort to sustain power on non-windy days. Last night was our annual JD Edwards Christmas party. It’s kind of funny since JD Edwards hasn’t existed for 7 or 8 years now, having been purchased by Peoplesoft, who was purchased by Oracle a couple years later. All of us had worked together for varying lengths of time before the merger, many of us in the same technology Operations department, and we had started getting together then for a Christmas party. Despite most of us moving on to new jobs, we still get together. This past year the lunches are further apart and the communication is a little less, but we still have the party and look forward to it. We bring the kids, have a good time, and exchange gifts in the annual White Elephant Gift Exchange where all gifts are wrapped and we pick numbers from a hat, taking turns opening a random gift or stealing one that’s already opened. That party has caused some problems with kids over the years as gifts are stolen, and it’s had some fun moments as we’ve had the “Tree” passed from person to person over the years. We had it a couple years ago and thankfully haven’t gotten it again. Whoever gets it is supposed to regift it the next year, not sure how that tradition started, but it didn’t come back last night. A few people didn’t make it, so maybe it will make an appearance next year. There’s also an animated stuffed monkey that has been around and did come back. This year I was tired, the kids were all feeling slightly sick, and it was more hanging out catching up with people for most of the evening. I avoided the gift exchange with all the yelling and cheering, not wanting to be the middle of that. Kyle ended up with a huge whoopie cushion and Delaney stole a KNEX set from someone the 3rd time, keeping it safe for him. No need to try and hide it this year. As people drifted away, especially those with younger kids, it seemed that the rest made their way to the basement. Rock Band was setup down there and I thought it was mostly kids and teenagers. When we started going our kids were small, shy, and clung to us. Quite a few of those early parties had either Tia or I downstairs with the kids playing As they’ve gotten older, they’ve started to mix well with other kids and Kendall spent almost the whole night down with other kids, shooting pool and playing ping pong while Kyle and Delaney did those things but also joined in Rock Band. When I went down about 11 or so, Tia was singing with another lady while the instruments were manned by others. It was pretty cool. Despite being tired, I got pulled into the drums when someone else quit and did OK on the medium setting, but my foot was getting tired so I switched to the easy setting to have less bass pedals. I actually thought I’d have none, but that didn’t work. It was a fun party, but getting home at 2 was tough. I had 2 beers between 6:30 and 7:30 and then drank about 10 bottles of water, so I wasn’t impaired, and I’m not hung-over, but I had a headache when I got home, and my eyes ached. It was a hard drive back, about 18 miles. This morning I will have a headache and I didn’t want to wake up, but after a week plus of getting kids up, I couldn’t help it. Not quite as quiet as I wanted, but still quiet. Hanging out, only needing to get Delaney and then we had plans to decorate the tree. Instead I was driving to get Delaney and he called me, asking if he could stay longer. I had errands to run, so I agreed, going to the Big R for ranch stuff, the grocer, and bank. When we got home it was later than we wanted, 12-ish and Tia wanted to ride. They’d put up the tree, but not decorated it, so we ended up splitting up. I worked a touch and ran before doing some Rock Band with the kids before we started getting ready for the Christmas party. I was glad I didn’t have to go out and do horse chores, but I did wander out there to check on Tia before we left and ended up filling water and shoveling some manure. My first tenant called me tonight at 9:00 to say his furnace wasn't working. I was thinking I'd send someone tonight, pay the overage, but he then said it wasn't working last night and he was messing with it all day, deciding to call me tonight. Great. That plus him buying some portable heaters made me rethink things. I said I'd send someone in the am, and I called and left a message with the company I've used before. I shudder to think what this bill might be after dropping $450 on the other rental. The good news is we got a lease and tenant in our third rental, so we're all rented up again. With all the cold weather I'm on a bit of a soup kick right now, trying some new ones. I love the Creamy Tomato Bisque from Safeway, but they were out of it the other day, so I grabbed a few chunky soups, including a chunky tomato, and then grabbed a Safeway Coconut Red Curry Chicken Bisque. I had the latter today and it was excellent! I'm debating having a second bowl now, but I think I'll hold off until tomorrow or tonight for the rest of it. I love the fire roasted tomato soup at Paradise and I searched around for a recipe. I actually found a few and sent them to myself in email, but I must have deleted them because I couldn't find them when I was at the store yesterday. I need to search them out again and save them for my next trip. I also want to make some bread. I had some great dark bread the other day and it's hard to find it in the stores. I got some multi-grain the other day, but it wasn't as good. I want to start making some, and soup, as I'm working once I get my laptop back. It's not just cold, but cold as (insert your favorite saying here). 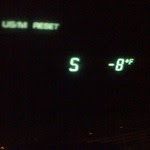 Tia left last night on what I think is the coldest day of the year. 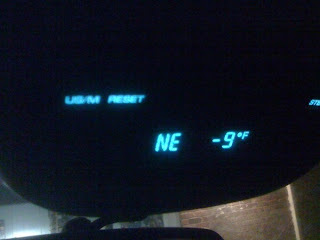 Probably the coldest day I've experienced in Colorado, temperature wise. Thankfully there was no wind otherwise it would really be unbearable. I'm ready to go buy thermal underwear, new boots, electric heated gloves and who knows what else. The other day I snapped this shot in the car. Wow, now that was cold. And it was afternoon, about 4, so we thought it might get colder. It certainly did with this being the show last night as we came home from Delaney's middle school concert. 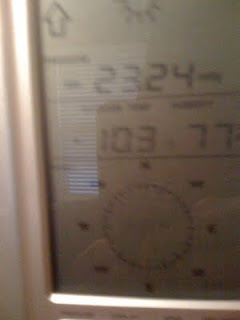 This morning when I woke up, the weather station on the wall showed -10, which was the coldest I've ever seen it be. After getting kids to school, I then drove back home, ready to grab a bite to eat, get a cup of coffee, and fortify myself to go out to the barn. Hat on, sweathshirt, gloves, boots, ready to go. I get out and take out a few flakes of hay to get the horses going and noticed that the water tank outside was low and had ice in the last inch or two. My first thought was that the fuse had blown, so I walked in to check the water in Gemini's stall. It was fine, half full, liquid. Hmmmm. I walked into the tack room for the hose, thinking I'd start filling the tank and go check fuses. The lights were on, so it didn't seem the fuse was blown. I felt the heater, on low, and it was working, although it was cooler than expected. I dragged the hose out, hooked it up and went to open the valve to check if the way was clear. It wouldn't open. So I walked back to the tack room thinking I'd find some pliers to help loosen it and noticed the cat's water was frozen. that didn't seem right, but the water had frozen in the bowl and in about half of the plastic bottle holding more water. Something wasn't right, and I didn't have pliers, so I walked back to the house to get some. Checked the breakers, and they were fine, grabbed pliers and a hose, and walked back. Put pliers on the valve and broke it. @#$%%$#%#$ ice and cold weather. Actually I should have repeated it about 30 times, but I figured with the broken valve I'd go to the store and get a new one, a new hose, and get set up again. As soon as I submerged the heater it steamed up, so it was on and working. With 6-8" of water in there, I spread around 3 more flakes, including about 3/4 a flake of alfalfa and everything was set. Came inside, time to work. It's going to be a long day. It's cold outside, hoses frozen, and as I'm about to try and get through a work call before going to get a hose from town, Delaney calls. He's sick, threw up at school. Poor kid sounds bad, so I'm off to get him. I'm guessing it will be a quiet night tonight, no karate or tutoring. I got up, started the truck, and drove Delaney down to his bus stop. It was cold and icy, with my weather station reading 2.4F again this morning. 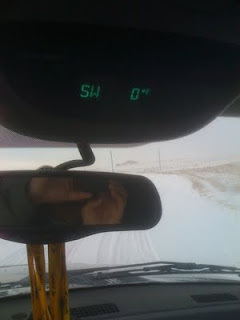 I think that might be the lowest it goes since we got in the truck and it read 7 when we started, going down to 0F as I waited for the bus. I came home, said good-bye to Kyle, and got coffee ready. I was just getting back to the office when the phone rang and Kyle came on the answering machine. He was stuck, off the road in the neighborhood. I packed up, and headed down the road in the truck. I thought he had missed the turn and slid off into the ditch beyond the road. It's not a deep ditch, just a foot or so down, but that's plenty to get his car stuck. Instead he had slid off the road before the turn, so I'm guessing he just drifted to the side of the road and slid down enough to get stuck. I didn't see a hookup in the back of his car and was worried about slipping on the ice, but I hooked up close in front and easily pulled him loose, letting the truck idle forward and get him out. Tia had said to wear snow pants, which I didn't, and had to kneel down to connect and disconnect the tow rope, but it wasn't bad. Only outside for about a minute total. I followed him out of the neighborhood, where the roads were much better. Hopefully he'll be OK moving around to and from school. Once again the BCS is set, and we have five match ups of the top teams. I'm not necessarily for a playoff system, though I'm not opposed to it either. I think it can work, but I don't know it solves everything. I don't know it can go to 8 teams, but if it does, maybe most people will be OK. But given the current system, which does a good job of #1 v #2, why can't we also make it easy to get the other seeds set. I would think we'd be playing 1 v 2, 3 v 4, 5 v 6, etc. Instead the non-BCS teams, TCU and Boise State, playing each other. Don't get me wrong. I think that will be a great game as both these teams can put up points, but why matching them up with each other? I think TCU especially, ranked 3rd or 4th, should get the chance to play Cincinnati and prove they are worthy of the BCS. It all comes down to money and I think the reason we don't have a playoff is the money isn't right for the non-BCS schools. We need a better way to ensure that all these other schools still get bowl games and get exposure, and funding, from their efforts. The issue with doing a playoff earlier, and maybe even Bowl games earlier, is that people might not watch them. Or go. I suppose we could put games the week before Christmas and a few between Christmas and New years, and then start a playoff, but if we were to start a playoff, say next weekend or in two weeks, who would watch the other bowl games? It's a tough thing to manage and for now, I think the way things work is the best way. Already the stretch of the championship game from Jan 1 to the 7th or 8th is too long. I'm done with CFB by then and worried about the NFL. They should go back to all the games, or most of them on Jan 1, then maybe a +1 game the next weekend if they really want it. I woke up first this morning to a quiet house. The kids were all gone at friends or relatives and it felt strange. I made some coffee and was going to watch some Sportscenter upstairs, but Tia was still asleep and so I decided to watch downstairs. I kicked on the TV, hoping to see the Texas-Nebraska game from last night, which had a great ending. It was slow to come up, so I decided to kick on the XBOX and play a little Rock Band. I'd been trying to get a tour going and unlock more songs for us, but haven't had a lot of time. And it's hard to motivate kids to play with me. So I was down there solo, playing a little guitar on medium, nailing some 100%s and a bunch of high 90s. I unlocked two new cities and a bunch of songs and venues. It was a nice way to spend an hour this morning before Tia woke up and came downstairs, recruiting me for some horse chores on a cold morning. We were supposed to get snow, and we got a couple inches, but it wasn't too bad out ther. 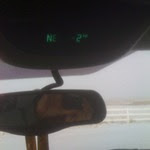 Cold, but very little wind and so it wasn't bad as we fed hay, heated water, and I had ot pick out some ice and snow from hooves. That's a new one for me. I helped Tia clean out hooves recently, but it's not really something I like doing. It's a little scary having my face anywhere near the hoof. Tia holds them up, which is all she can do with one arm, and I have a little metal pick that I used to scrape out the hoof. There's a couple grooves in there and I have to push down and dig out snow, ice, and manure. Gemeni was actually walking a half inch or so above the ground on his front hooves, so we picked things out. He immediately went outside, came back in, and had more ice on the hooves. The solution? PAM. Tia keeps some in the barn, and so I scraped them clean again and sprayed PAM on the hooves, which keeps snow from sticking. Kind of amazing. I'm not ready to trim hooves, but I have a new skill that hopefully I won't have to do too much. Not sure I can do it myself, either. We got a call from my father-in-law yesterday that his kitchen sink was clogged, and needed plumbing help. He'd tried to take apart the trap, but it wasn't the issue, so I called my plumber specialist right away. He didn't have a big snake and suggested a drain cleaner, so I made an appointment for him to come by after lunch. I had errands to run, so I headed down there after my run, got a few things done and then met the drain guy. I'm glad I didn't try to mess with it as he had a large power snake and used it to clear things, but also he had trouble getting the snake to go down to the main under the house. It kept wanting to move up the other part of the Y where the upstairs bathroom drains. I would have been driven crazy with that. He cleared it out, but also noticed that a pipe in the crawl space was cracked, something I probably would not have noticed. So I called the plumber back and scheduled an appointment. We need a pressure regulator replaced as well, so I needed him anyway, but now I know I can't let it go for weeks. $95 later and more to come, things are at least working. Today was one of the annual fundraisers for the Boy Scouts up at Bass Pro Shops. We went to the spring one, and we had another weekend scheduled again today for the boys to set up out front and cook hamburders and hot dogs, brats, and sell them to customers coming in to or out of the store. Delaney struggled to get up, but this is his way of earning some of the cost of Scouting back. The boys get a percentage of the profts into their Scout account, and it can pay for summer camp and other events. We had been assigned to purchase a canopy this week, which I did yesterday, and we drove it up there this morning, North of Denver. I was a little worried as it was supposed to be cold. We had hats and gloves, but with the sun shining, and it getting into the mid 30s, it wasn't bad. We stood out there, selling things and working with other scouts and Dads. 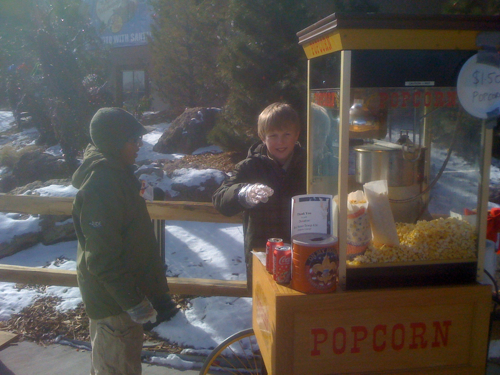 Delaney worked the popcorn for awhile, then moved to Brat assembly, and did well, but when 2 came around, he was ready to leave. We'd signed up for a half day only, and I was cold as well, so I was happy to leave. We did walk around BPS for awhile, but managed to escape without spending any money. Now we have a break for a few weeks and then we go back up there the day before Christmas to help wrap presents and earn some tips for the boys. New York funding Great Lakes Wind Power? According to this C|Net report, New York state wants someone to build wind farms in the great lakes and purchase all the power if they’re built. That’s nice to hear, but it’s not a great PR move after their attempt to build them off Long Island generated so much controversy. I’d like to see more Wind Farms in New York as well, especially since they have lots of sailing water on the East side of the state. I did find it interested that wind farms offshore cost about double as onshore ones. That shouldn’t be surprising with all the below water anchoring needed, but it is for me. I somehow was thinking they’d be comparable since you have to anchor both to handle stresses. The payback might be better since water has more wind across it, the temperature changes more rapidly and so more power can be generated. Of course maintenance might be higher, not just with the windmill, but also with the cabling that crosses the water. Salt water is incredibly corrosive, so that can be an issue. My knee is bugging me still. It wasn't bad on the run yesterday, more like a jog, but then it felt sore, I felt sick (throat) and skipped karate. I hated to do that, but I knew Delaney wouldn't mind and I could use the rest. In fact, I fell asleep around 8, woke up around 4am, went back to sleep until 7. I'm not sure what I did, but the front of the knee is slightly scraped. Makes me think that Delaney running into me at snowboarding is what hurt it and running/karate have prolonged it. My laptop died recently, actually died completely, unable to boot. The hard drive was fine, and I managed to stick it in my desktop and recover my files. The critical stuff (writing) was backed up with Live Mesh and had moved to the desktop already, but hadn’t been on the netbook as it hadn’t been powered on in about a week or two. So I fired it up to ensure that I had 2 copies of the critical stuff. Once things had moved across, I was hoping to actually get some work done away from my desk. About two-thirds of more of my writing takes place away from my desk. I lie in bed, or work in a coffee shop, before karate, etc. It’s more inspirational to me, and I depend on it. However the netbook really slowed me down. I’ve written before that I run many things on here, Office, SQL Server, I blog, write, etc. and it works well. It does work well once I’m doing something like writing, but switching applications, getting started, it’s slow. In fact so slow that I was frustrated getting the browser started and OneNote fired up. I traced some of this to a full drive, with over 15.8GB of stuff on my 16GB drive, and had to clean that out. Once that was done, things improved, but it was still slow to get started. When you try to switch applications, things take time and you have to be prepared for that. When I’m just writing, this is OK as I’m moving at a slower pace, I need to think, etc. However when I’m doing other work, editing, checking on the site, moving between aplications, it’s very, very frustrating. So much so that I know that this netbook isn’t a possible full-time replacement for a laptop. I’d considered one for the kids, especially my oldest, but it’s not going to work. He’ll need a real laptop for college, not a netbook. I still like the form factor, and times like this, where I’m catching up on blogging or writing while waiting for the kids at karate or tutoring it’s much nicer. The form factor works well. I can do email, browse, or write on it. But trying to really work, or get multiple things done doesn’t work so well. From a Forrester blog: Ten eReader and eBook predictions for 2010. It’s an interesting read, and I tend to agree with things. Once there are alternatives to e-Ink, I think we’ll have an explosion of devices, and the inclusion of the e-paper in other devices. I also think Amazon will retain the large market share, but that will go down. The B&N entry, with their book collection as well as the ability to read Google public domain books and lend the books to other people is big. At least to me. I’d like to be able to let someone try a book for a few days and see if they want to buy it. I really think the winners will start to come when people get get books from multiple sources and consolidate them. For me, I’ve enjoyed reading on the iPhone for the last 5-6 months. It’s worked well, and being able to spend money at Amazon and B&N, as well as get free books on Stanza has been great. I’d like one reader app, but the iPhone works well for me now. And I like it because I sometimes get GCs for Amazon, sometimes for B&N. I think Amazon messed up trying to control things too much. They should have spun off the Kindle after a year, opened it to books from other sources, and added clients for other platforms. That would have made it hard for B&N to even enter the market. Instead they tried to control the whole platform. Even Apple can’t do that, with lots of non-iPod MP3 players as well as computers. I’m not sure when I’d buy another special purpose device for reading. I read a lot, 50-70 books a year, and while the screen on the Kindle is much, much better than the iPhone, it’s not $300 better. I’m not sure it’s $200 better, maybe $100 better and even then I’d probably not carry the Kindle device as much since I have an iPhone app. I got up this morning and as forecast, there was snow on the ground. I took Kendall to school, and it wasn’t bad, but it definitely started to get worse when I went to the barn to help Tia feed. It was coming down more and more and seemed to be getting colder. What’s kind of amazing is that yesterday I took Tia to the ortho to have her cast changed, and I was a little cold, but not much as I walked through the parking lot in a t-shirt and jeans. Today I need a hat and gloves along with the coat. I’m glad I called Toshiba last night. When my laptop died on Sunday, and never came back Monday, I wasn’t sure what to do. I searched through all my folders, but couldn’t find a warranty item and when I checked the Toshiba site, it said I was out of warranty. So I pulled the drive and copied things off it onto my desktop, getting copies just in case and so I could continue working. Then yesterday I called Toshiba in the afternoon to get a price for a repair. After all, a new laptop would be in the $1500 range and I wasn’t sure what my boss would pay. So I just thought I’d compare and then decide. Turns out I have an extended warranty that wasn’t showing up on the Toshiba site. I have typically gone to 3 year service plans, just in case, for machines, and I was pricing that into a new laptop. I figure that I need things fixed in that time frame, and after 3 years I’d just get a new one anyway. This one is 2 years old, so it would be good to get through 2010, or most of it before buying a new one. Seems like Quad cores are just getting into new machines, and I’d like to go with one on the next laptop. So I got an order going, and drove down last night to ship out the laptop. It should arrive at Toshiba tomorrow and then we’ll see how long it takes to get it fixed and back. In the meantime I’m moving forward with more setup on the desktop to be sure I can work. I sure do miss working from bed with the laptop, however. I was thinking about goals recently after talking with someone that was looking to get back into shape. They had set a goal to exercise every day in December, which I think it pretty good. However it got me thinking about running, especially with some struggles lately to run. That sounds cool. And I’m most of the way there, having run every day in the first 11 months of the year. I’m close, and it will server until I get to 500 days, but I think that will be another cool accomplishment to add to this streak. I tend to root for some teams when I watch, not sure why I pick some teams. I often can watch a football or basketball game and choose sides. It’s something I do, even when my favorite teams (Denver teams, Yankees, Lakers, Cowboys) aren’t playing. It’s only rarely that I actually root against teams, but it seems that I tend to do that for the Boston teams. Not sure why, I like Boston as a town, but I’ve always looked for the Patriots, Celtics, and Red Sox to lose. So despite being tired, I enjoyed the a**-kicking that the Saints handed out to the Patriots last night. I stayed up, only killing the game when Hoyle came out for his second series. Five minutes left and I couldn’t believe that Brady came out of the game. But I’m not completely surprised. I don’t think he has a lot of class as a player, he appears to be a little whiny, and while not a quitter, quitting on that game is something that doesn’t surprise me. It’s kind of cool to have two 11-0 teams, and I’m rooting for them to meet in the Super Bowl. I’m not sure either the Broncos or Cowboys can challenge, so it’s nice to think about having a pair of undefeated teams meeting each other.